How do you engage the people that visit your website? How do you collect their email addresses for your newsletter? How do you get your offer noticed? You can put a few widgets in the sidebar, sit back and wait. There are more, and better, ways to grab the attention of your visitors. With pop-ups, slide-ins, messages, action bars, or that big screen that comes falling down 2 seconds after you visit a website. Many people find them annoying, many experts say they’re no good or don’t work. But why do so many websites use those methods. Probably because they work…? Personally I’m not a big fan of pop-ups. What really annoys me, is that big screen falling down, pushing down all content. 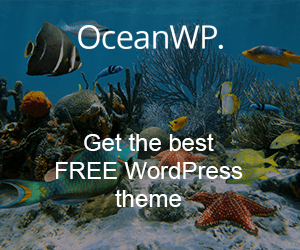 But I do want a few special effects to grab some extra attention for the WordPress quiz on this website, and to make people submit their feed on World of WordPress. For every piece of functionality you can get a plugin. A plugin for pop-ups, one for messages, one for actions bars. And I tried a lot of them! Some were great, some were really terrible. I won’t list them all. And then I found a plugin that had all the options I was looking for. It’s called Icegram and I’m using it on three websites now! What can be easier than using a plugin that offers various options that can be used in many different ways? It’s a little bit more complicated than that. 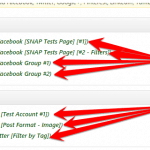 The more functionality a plugin offers, the more you have to explore and test. Icegram is such a plugin. A lot of options, that can be very useful when configured well. 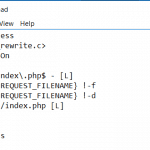 It is what you can do with these four basic options, that makes the plugin interesting. 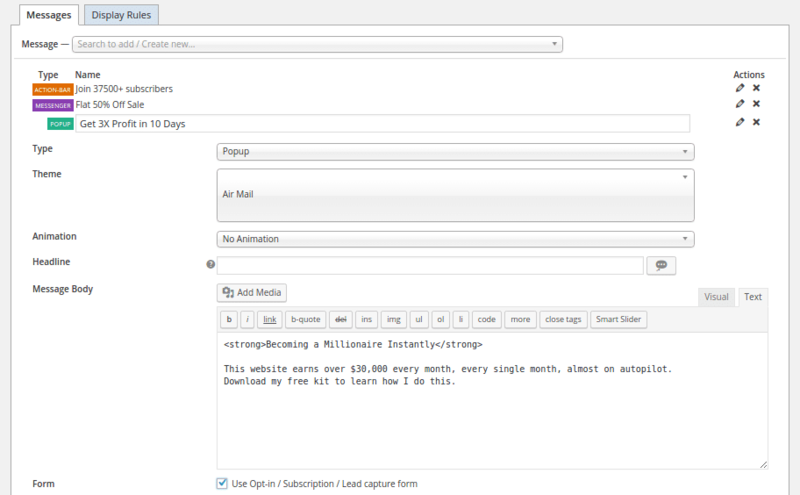 Show attention grabbing, high converting email optin forms and build your subscriber list. 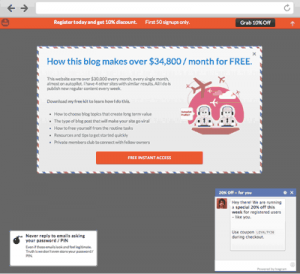 Display call to action (CTA) buttons and drive visitors to any page you like. Grab visitors’ attention, make an announcement, engage them to reduce bounce rate or offer them any other call to action. Combine the various options in one or more campaigns. Icegram uses campaigns to manage the messages. It is possible to have multiple messages in one campaign. 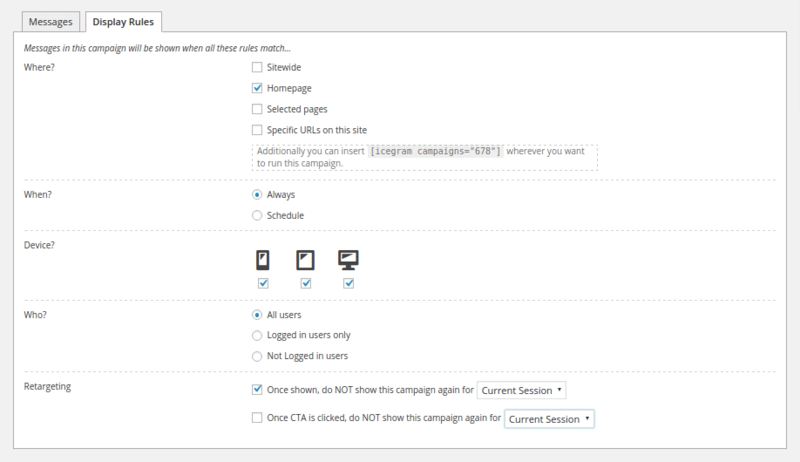 You can also run multiple campaigns at the same time. This way you can configure a lot of different messages for each part of your website. It may take a while to figure out all the options. Starting with a handwritten strategy can be very useful! On the image below you can see the message editing screen for a new or existing campaign. Here you can choose from four different types of messages. Set the theme, the text, target link or subscription form, anything you can think of. In this example, three different kind of messages are used. On the image below you can see the options to set up the display rules. Right here you can configure where the message appears, when it appears, on what devices it appears and to who. The last option is about retargeting: should the message re-appear and when. This free version of Icegram is very nice to use. Because it’s free, it has limited options. The pro version offers a lot more. But the free version is very good to start with. 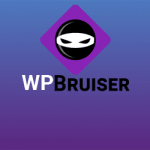 According to the developer, most similar quality plugins are paid and still offer a lot less. I’ll take their word for it. 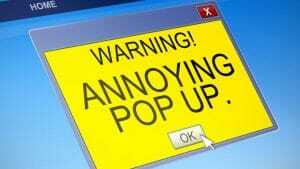 I’m still no fan of pop-ups and other annoying messages. But this plugin gives me enough options and control to use them anyway. You can find this plugin right here. Icegram has over 20.000 active installs and has a rating of 4.8 on WordPress.org.